Kaziranga National Park, a UNESCO Natural World Heritage Site, comprises large stretches of swamp interspersed with broad tracts of tall elephant grass, evergreen forests, watercourses and reed beds. 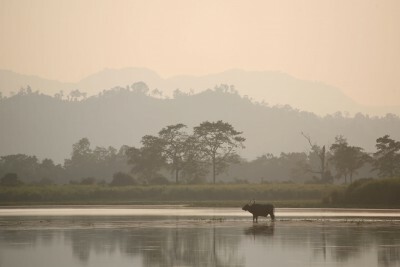 With its backdrop of the mighty Himalaya, Kaziranga is on an impressive scale – with wildlife to match. It is one of the best places to see the rare great Indian one-horned rhinoceros with a population of over 2000 animals (around 80% of the global population). Indian elephants are plentiful as are herds of wild water buffalo, wild boar, grazing sambar, hog deer and swamp deer. There is also a healthy tiger population with up to 160 individuals, giving one of the highest tiger densities in India: however, the terrain and vegetation make the cats fairly difficult to observe. Kaziranga boasts a tremendously varied bird list. The wetlands attract storks, herons, wildfowl and waders, with significant numbers of spot-billed pelicans, bar-headed geese, and black-necked, greater and lesser adjutant storks. From time to time the waterbirds are alarmed by the appearance of grey-headed or Pallas’s fish-eagles, just two of an impressive variety of raptors. Pied harriers glide over the waving grasses, occasionally startling a Bengal florican or a noisy flock of red-breasted parakeets. Your day would usually begin with an elephant safari at dawn to watch the sun rise through the early morning mists and for close sightings of deer, rhino and wild elephant which are very tolerant of the elephants’ presence. This is also your best chance of glimpsing tigers stalking in the undergrowth. Game drives allow you to explore further afield: there are also a number of towers giving superb wildlife viewing over the lakes and marshes of this extraordinary national park.